In the summer of 2012, I decided to take a crack at the 50/90 Challenge, which for the uninitiated, is a songwriting activity where participants aim to write and demo, from scratch, fifty songs in the space of ninety days. 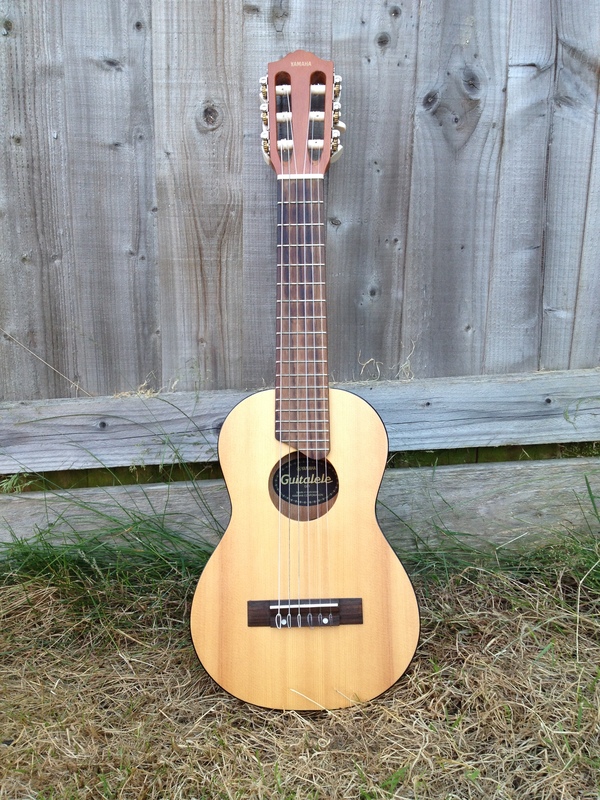 To cut a long story short: as the start of the 2012 Challenge approached, I had two ideas in this area: either a budget concert- or tenor ukulele, or a new discovery of mine – a Yamaha Guitalele. Ultimately, I decided the Yamaha’s two extra strings should give me a bit more flexibility on the composition front, so I ordered one online (where you can find them for around £60). The Yamaha GL-1 has been in their range since 1997, which must make it one of the company’s best-kept secrets, as I hadn’t heard of it before 2012. Depending on how you look at it, the guitalele is either a baby Spanish guitar tuned up a fourth (ADGCEA, like capo-ing a guitar at the fifth fret), or a tenor-size ukulele with two extra bass strings (a tenor uke is usually tuned GCEA low-to-high). In other words, this guitar-ukulele hybrid shouldn’t present too many problems for players of either instrument to adapt to, and I didn’t find it difficult to get used to, once I got over the GL-1’s diminutive scale. I came to nickname the guitalele “Tigger”, due to the distinct stripes in the wood grain on the top of my example, and also because of the instrument’s often-cheery and bouncy nature (or so it seemed to me!). The Yamaha arrived early in the 50/90 Challenge, and I ended up writing many of my songs for the Challenge with it. I also played the guitalele on many of the song demos, and you can hear it on quite a few other songs I’ve recorded since. So what is it like to play? Due to its small size, the guitalele takes a little getting used-to, especially if you are a guitarist (though even ukulele players might find the string-spacing a bit cramped at first), but after a time I felt quite familiar finding my way around. Sound-wise, the GL-1 makes for an interesting hybrid; genuinely, somewhere inbetween a Spanish guitar (albeit less bassy) and a larger uke (say, a tenor). I particularly like its tone when fingerpicked, which to my ears is almost lute-like (good example: my rough acoustic demo of “Before The War” from my FAWM 2013 album “Homecooked”). The GL-1 comes with no strap-buttons or pickup, so after a few months I got a local music-shop to install both (a “bug” transducer in the latter case) on mine. I haven’t used the pickup much to date, as I don’t play live very much and tend to use microphones when recording, but it’s handy to have the potential to “plug in”, and the facility of a strap is a great improvement. Along with my Ministar Testar, the size and versatility of the GL-1 makes it a great travel guitar. I’ve taken the guitalele around with me, and recorded demos with it in some unusual places, including the “back-garden” of my workplace, and the bedroom of a holiday chalet! It’s occasionally not ideal that the GL-1 is acoustic (size and noise), and I sometimes wish Yamaha would launch a solid-electric guitalele, as I think that would make the perfect travel guitar. If they somehow added a MIDI pickup for controlling synths as well, I’d be seriously interested!